I hear the cool kids like to post pictures of their cats on their blogs sometimes. Except I think you’re supposed to do it on Fridays. In 2005. Well, never let it be said that Ocelopotamus colors inside the lines! Anyway, here’s Barabajagal (aka Mr. Blue) and Kiwi, even though they don’t really deserve the good publicity after what they did to my shower curtain. That’s Kiwi with the tiger stripes and the attitude on the left, and Mr. Blue is the big one on the right. 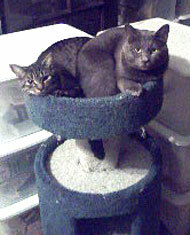 This is the only time I’ve caught them sharing the crow’s nest of the cat tree like this â€” usually it’s an ongoing squabble for dominance. So I call this shot “The Peaceable Kingdom,” which is my name for those very rare moments when I catch them curled up in the same spot instead of gnawing on each other mercilessly or windmilling their paws at each other. Speaking of cats, and dogs, it’s looking like wheat gluten may be the problem ingredient behind the big pet food recall. Kiwi and Mr. Blue get Science Diet, which hasn’t been implicated in any deaths, but Science Diet voluntarily added themselves to the recall because apparently some of their food is made by Menu Foods. Specifically, their “Savory Cuts” varieties, and I did have some cans of that stuff sitting on top of the fridge. I checked the lot numbers on the bottoms of the cans against the ones listed on Science Diet’s recall page, and fortunately none of the cans I had matched the dates and numbers listed. But I’m still not entirely sure I’m comfortable serving it up to the boys after all this. One interesting aspect of this incident is that it’s exposed to the public something corporations don’t want you to know, or at least not think too much about: the relative meaninglessness of brand names and labels. Look at this list of 42 different brands of cat food, all made by the same manufacturing company, Menu Foods. And there’s another list just like it for 51 brands of dog food. These companies spend millions to convince us we’re buying something special and different from the other cans on the shelf, but the truth is it all came out of the same factory. And this tragic episode has given consumers a rare glimpse behind the branding smokescreen. What’s even scarier is that all those pet food companies are self-regulated through an industry group called AAFCO — there are no laws governing what can or can’t be used in food for animals. They can put whatever the hell they want in the kibbles, which usually means the cheapest, nastiest stuff available. I just did some digging, and you are totally right about AAFCO. The crap they put in there is truly horrifying. I felt so bad about my dogs after reading that, that I went out to the grocery store and bought real meat and fish and came home and fed it to them. And what do you know — Luka hates shrimp. I give my cat Royal Canin dry food but I give her Nutro Max pouch food twice a day (half in the morning, half at night) and the pouches I had were on the recall list. I was panicked because I had already noticed that she was drinking and using the litterbox much more than usual. She was eating tainted food for a week before the recall! Luckily she seems fine now, but I was angry. I had no idea all those foods were made at the same plant. I happilypay more to give her “quality” food specifically so she doesn’t get sick! I feel horrible for the people who lost pets. I can imagine how devastated they must be.